Whoever did promotions for In Bruges should be canned. Poster/trailer makes the film look like another shoot-em-up testosterone fest. I would never have seen this film if I hadn't spent last night in a tiny town in upstate New York where the only other option was Horton Hears a Who. 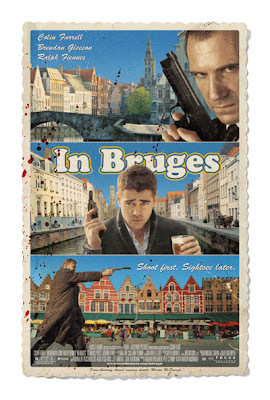 To the glad surprise of myself & my discriminating companion (film-elitist daughter), In Bruges turns out to be a rare piece of footage where everything works: sets, dialogue, lighting, photog, plot, character development. Plus, it's funny as hell. Despite what its promoters have to say. Of course, it's not the only instance of a film/poster disconnect. Says Craig McNamara. To be honest though, I prefer this approach to a killer trailer and then a gut wrenching torture fest at the theaters. I hope enough word of mouth pushes the movie though since I'll check it out because of this referral and if I like it, will do the same on our small WAS nation in the blogosphere. Hope you'll find it as worthy of $10 and 2 hrs as I did, Joker.